2016년 4월, DREAM의 연구원으로 함께 드림에서 일을 시작하게 될 때에는 인권분야에 대해 더 알고 싶고 또 도움이 필요한 분들에게 도움이 되고 싶어서 시작했지만, 연구원이 끝나는 이 시점에서 저는 제 삶이 DREAM으로 인해 완전히 바뀐 것을 경험하였습니다. 그 동안 다양한 분야에 대해 연구하고 프로젝트를 진행하면서 여러 인권 이슈에 대해 알게 되었음 과 동시에 하나님께서 저에게 제가 변호사가 되어야 하는 목표에 대해 명확한 마음을 주셨습니다. 그것은 바로 DREAM에서 배운 것을 토대로 변호사가 되어 도움이 필요한 사람들에게 도움을 주라는 뜻이었습니다. DREAM에서 연구원으로써 일하지 않았다면 받을 수 없는 귀한 하나님의 말씀이기에, DREAM은 제 삶의 목표를 송두리째 바꿔놓은 너무나도 소중한 경험이었습니다. 이번 2017년 인턴십은 다양한 학생들과 함께 할 수 있어서 더욱 더 빛을 발 할 수 있었던 것 같습니다. 세 팀으로 나누어져서 서로 맡은 일에 최선을 다했기에 지금의 너무나도 풍성한 결과를 맺을 수 있었던 것 같습니다. 저는 특별히 인턴과는 구별되어 DREAM의 2016년 총 재무회계를 담당하였는데, 2016년 DREAM의 활동을 다시 한번 돌아보면서 DREAM이 정말 많은 일을 해왔다는 것을 깨 닳았습니다. 난민분을 돕기 위해 크라우드 펀딩을 하기도 하였고, 결혼이주여성, 외국인 영어선생님에게 무료 법률 상담을 제공하였으며, E-6비자 인식제고를 위해 필리핀으로 아웃리치를 다녀오기도 하였습니다. 2016년 DREAM의 영수증을 보면서 DREAM은 2016년 최선을 다했고, 그래서 여러 많은 분들에게 도움을 드릴 수 있었다는 것을 느꼇습니다. 2017년 인턴십을 시작으로, DREAM은 또다른 풍성한 한 해를 맞이하기 위해 끊임없이 노력할 것이며 그 안에서 하나님이 기뻐하시는 일을 하기 위해 노력할 것임을 믿어 의심치 않습니다. DREAM 연구원으로써는 마지막이지만, 마지막이라는 표현보다는 잠시 쉬어간다는 표현을 쓰고 싶습니다. 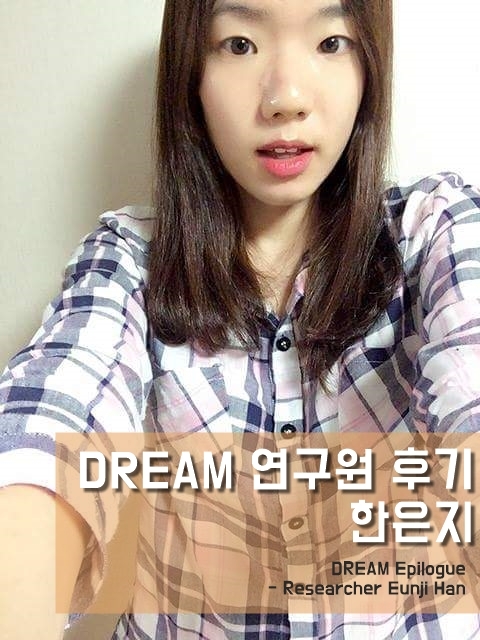 기회가 된다면 다시 DREAM의 일원으로 DREAM의 프로젝트에 함께 참여하고 싶습니다. In April 2016, when I started working as a researcher at DREAM, my goal was just to know more about human rights issues and help people who are in need. However, I realized that working at DREAM totally changed my life. As DREAM was researching and preparing for various projects, I learned about many human rights issues and at the same time, God poured me with clear reasons why I have to be a lawyer in the future. The only reason is to help the people who are in need according to what I’ve learned from DREAM. If I did not work at DREAM, I could not realize God’s plan for me; therefore, working at DREAM was a life-changing experience for me. DREAM’s winter internship in 2017 was successful because various students from Handong Global University and Handong International Law School worked together in one. They were divided into three groups and they did their best in their works which brought prosperous outcomes. I was responsible for the financial accounting of DREAM. I organized all the purchases and expenses of DREAM starting from January 2016 to December 2016. As I was organizing, I realized that DREAM had many activities during 2016. We successfully finished the crowd funding project for the Cambodian with humanitarian status, provided free legal consultation for the international marriage visa holder and English teachers, and visited the Philippines to raise awareness regarding E-6 Visa. Looking at the purchases and expenses, I was confident that DREAM worked hard and was able to help many people as a result in 2016. I surely believe that DREAM will do its best to bring prosperous outcomes in 2017 starting from this winter internship. I do not want to say that this is the end of my work as a researcher at DREAM. I am just pausing so that I can be well-prepared and work with DREAM again in the future.